Ufone already has launched an astonishing Ufone Ramzan Offer with that Ufone clients are able to stay associated with their loved-ones this Ramadan without any doubts. 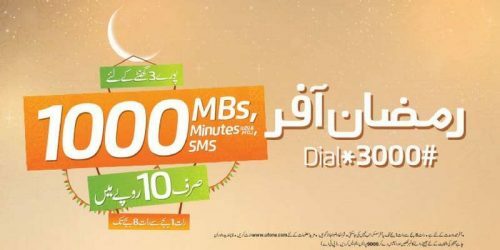 Ufone Ramzan Offer provides you 1000 MB Mobile Internet, 1000 (U2U and PTCL) Minutes and 1000 SMS for the following 03 hours. The offer can be subscribed between 1AM to 8PM in only Rs. 10 including tax. Following is the complete information that how you can Subscribe and Unsubscribe for this Ramzan offer by Ufone. Additional call setup fee of Rs. 0.13 + tax will be charged on every call. This was all about Ufone Ramzan Offer (Latest & Updated), I hope that you do not forget to share your thoughts in the comments section below and let us know wheatear you discover the above mentioned briefly discussed package / offer obliging and motivating. Be in the know, by basically joining our Telecombit Community to check what’s trending or to get latest updates related to the topics of your own selection.